I’ve been coming across blogs about Calaguas Island, but truth be told, as much as I am interested to go there, I couldn’t be bothered to plan going there because it seemed so hard. I prefer going to destinations where you just hop on a plane, ride a trike, taxi or van and you’re at the town already. As the saying go, nothing worth having comes easy. All that effort to go to the Calaguas is certainly worth it. What finally got me to go there was when one of the bloggers I follow announced that Calaguas is one of her destinations this year. One comment and a seat sale later, I am booked for a flight to Naga. Naga is the closest airport served by most domestic airlines. The closest is Daet, which is served by Seair, though only seasonal. From Naga, you have to ride a van to Daet, then transfer to another van to Paracale. In Paracale, you have to find a willing boatman (and an available boat) to take you out to Calaguas, and buy supplies for your stay there, since there are no stores, no electricity and no water. Save for the boat rental, the airfare and the van rides, this is a fairly inexpensive trip. It can be made cheaper if you take the bus instead of the plane, and just stay overnight. I think the bus schedule works well for a quick weekend getaway to a gorgeous deserted beach. 1 Taxi to and from the airport is expensive! From the airport, they charged me Php300 (I was alone since my travel buddies flew in to Legazpi). Going to the airport, the driver asked for Php 250. To be fair, it’s quite far, about 14 kilometers. 2 Php200 for a cottage we did not use. We were able to use their gazebo, so it’s all good. Plus, we also used the caretaker’s toilet and bathroom. 3 The room is big, has aircon and cable TV. There are two single beds in the room, so we paid extra for two additional beds and breakfast. Total cost for the four of us is Php1,710. 4 The original price the boatman gave us was Php 3,000, but Leidy was able to haggle it down to Php 2,300. Nelson and his crew were all so nice and helpful that we gave them Php 2,500 instead. 5 Php 1,000 for a 30-minute ride one-way to an island we only stayed at for about 30 minutes. 6 Meals include lunch at a carinderia (canteen) in Paracale, take out dinner for our night in Calaguas, instant noodles and other junkfood for breakfast the following day, breakfast at Jollibee, baby back ribs dinner at Graceland in Daet, and the juiciest fried chicken at Biggs in Naga. 7 The caretaker originally priced it at Php 150, but again, Leidy was able to bring the price down to Php 100. Our boatman tells us that the locals of Paracale only pay Php 30, or sometimes even free. 8 Php 15 per hour! super fast post! clap clap clap! waaaah i wanna go there too! wait, so the ferry ride only takes 30mins? Dyanie: 30 minutes to Apaua, almost 2 hours to Calaguas naman. Chyng: Gusto ko nang matulog!!! After El Nido, you’re hopping to another gorgeous island. I can’t say El Niño is a blessing but you sure do have plenty of sun to enjoy the outdoors right now. huwaw! that’s true, ang hirap puntahan ng beach na yan but it’s worth it. I read chyng’s post, you’re with her pala. I hope to travel with you and chyng in the future! read it from chyng that u’r w/ her. wish i could visit the place too. In anyways, ur posts will surely help in the future. Thank you for sharing ur experiences with us. tc! Hello, do you have the contact number of the boatman to Calaguas? Thanks! hi ate, do you have information about PNR? Phil National railway? We just visited Calaguas over the holidays, and I enjoyed it better than the islands of Caramoan. Better if you come in a group, we were able to reduce our expenses to P4000 for the 5-day trip we had of Camarines Norte and Sur. Ooh, nice! I’m so looking forward to a trip back to Calaguas! Hi. May i ask for the contact number of the boat you hired going to Calaguas? All my contact numbers for Calaguas are listed in my Calaguas Travel Guide. Thanks for answering my question, Nina. May I also know if there’s cellphone signal (Globe or Smart) on Calaguas, Mahabang Buhangin? Thanks. Last year, only Smart has signal in Mahabang Buhangin. I think there are only certain areas where you can get a signal. In Maculabo though (if you’re stopping there), there is Globe and Smart. with the package tour being organized by Lakwatserong Kusinero and Nano for only P3,500 for 3D2N inclusive of everything- rountrip land transfers, boat rentals, tents,meals,and activities,it is now so much easier, safer and cheaper to go to Calaguas Islands in my province Camarines Norte!! for van and boat rentals you can contact 09174067392/ 09482171007. FOR RENT BOAT SERVICE IN CALAGUAS ISLAND AT MAHABANG BUHANGIN BEACH RESORT VERY LOW LOW PRICE. 8 to 9 people.. .palanas paracale departure. .contact me? 09487177801 or email me on facebook? gerio.js@ gmail.com and you see the boat. .
hi 09395974397 yan po ung kilala qng my boat na pnparent paracale to calaguas.. dey can also be ur tourguide .. kz tga don po cla..
may ferry na ba na direchong caluagas from manila? Wala. Galing Paracale or Vinzons lang. Just wanna know, is it good to go there around January? 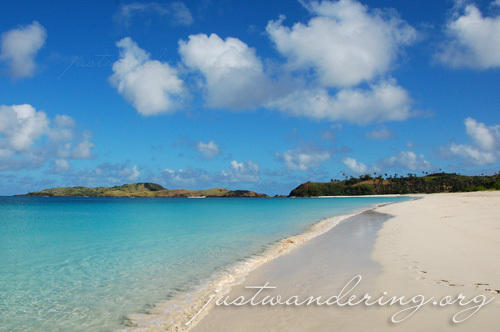 And also, could you kindly e-mail me of helpful information about travelling to Calaguas, I am really interested. I tried to check the link you provided for the travel guide however it did not give me any result. Was the post deleted? There might be strong winds because of the amihan, but from what I’ve been reading, people have been going throughout the year. Sorry about the link, I’ll get it fixed. Ah, I see.. Sure hope the winds would favor me.. Thanks for the information. I’ll check from time to time for the link, thanks! Wow..good details we have here. Remembered my travel to Calaguas last year. the waves were mad! FOR RENT BOAT SERVICE IN CALAGUAS ISLAND AT MAHABANG BUHANGIN BEACH RESORT VERY@@@@@@@@@@ LOW LOW @@@@@PRICE. 8 to 12 pax.. .palanas paracale departure. .contact me? 09077749519 or email me on facebook? gerio.js@live.com and you see the boat. .
Is an overnight stay in Calaguas just enough? I’m torn between 3D/2N or an overnight. It depends on you actually. Remember that there are no facilities in the island. No stores, no accommodation, no fresh water. hi .. if want nyo po mgrent ng boat paracale to calaguas “halabang baybay” may kilala po aq just contact dis # 09395974397 tenx.. tga calaguas po cla kaya pwd dn kaung i tour don..
hi guys,,,mgkano kya rent s boat frm. paracale to calaguas..thanks,, para naman my idea aq..